The SNP has performed a u-turn over its consultation on an independence referendum after a row erupted over claims it was fundamentally flawed. 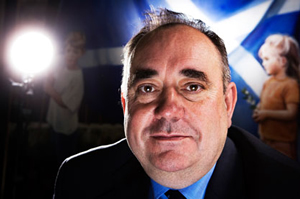 Alex Salmond’s SNP have performed a screeching u-turn over the conduct of its consultation on an independence referendum after a row erupted over claims the way it was being run was fundamentally flawed. Having published the “Your Scotland, Your Referendum” (pdf) consultation document in January, the Scottish government had over the weekend admitted members of the public could submit multiple anonymous responses, leading to accusations over the validity of the process. In a written parliamentary answer, the Cabinet Secretary for Parliamentary Business and Government Strategy, Bruce Crawford, explained that “all responses will be accepted” from those who keep their identity secret. “Considering the problem the SNP have with their cybernats, the likelihood of this consultation being distorted for the SNP’s own ends is enormous. This will add to the feeling Salmond is trying to rig the referendum. All along we have argued the running of this referendum must be independent and must be, and be seen to be, above reproach. Under such pressure, Ministers at Holyrood have now announced responses will only be accepted and included in the analysis of responses if they provide personal identification details. “The Scottish government’s referendum consultation is gathering huge levels of public interest as we debate and discuss Scotland’s future – and the robustness of the process is demonstrated by the fact that the consultation will be subject to independent analysis. This stands in stark contrast to the much smaller UK government consultation, which was not put to independent analysis. “As the figures we have published demonstrate, there is absolutely no evidence of anonymous responses skewing the process – quite the reverse – but we can and will make the process stronger still by requiring all submissions to have personal identification details before they are taken into account. While anonymous contributions would always have been separately identified, we will now ensure that no anonymous submissions are included in the analysis at all. “This is a humiliating climb-down for the SNP government, which appears to have lost control over its own consultation and now appears to be making it up as it goes along. Just 24 hours ago, the SNP government was claiming this was identical to previous consultations – this embarrassing u-turn shows they have been caught bang to rights. In an editorial, meanwhile, the Herald has argued Holyrood and Westminster each have something to learn about the consultations they either have or are undertaking. There is… a far more important issue at stake here than political point-scoring between the SNP and Labour. The SNP has said that previous consultations under the joint Labour-Liberal Democrat administration accepted anonymous contributions. There is a significant difference in relation to the consultation on the referendum. Its outcome will be used to shape the most important vote to be cast by the people of Scotland. Any allegation that it has been skewed or hijacked by one side or the other risks suspicion of political manipulation. By yesterday morning, 11,986 responses had been submitted to the consultation. That is an encouraging indication of the level of public involvement. While only 3.5% were anonymous and, according to Mr Crawford, there was no evidence of multiple identical responses from the same person, the possibility of organised duplicate submissions, whether from the SNP’s army of technologically-adept “cybernats” or from the Unionist parties, has left a question over the impartiality of the responses. In this regard, compared with the UK government’s consultation on the referendum, which allowed respondents to request anonymity only if they provided details of their identity which would be available for inspection to an overseeing body such as the Electoral Commission, the Scottish consultation looks flawed. The SNP was keen not to look as if it had been caught on the back foot by David Cameron but the announcement of a separate Scottish consultation would have benefited by being more rigorously tested for neutrality. The Scottish process, however, has the considerable advantage of responses being analysed by an external body, which will exclude any duplicates which appear to be from the same computer as well as anonymous submissions. This is a vital first step in regaining the transparency which Mr Salmond said would be an integral part of the process. It is also essential that the analysis is made public if it is to satisfy demand for accountability. Unless there is complete confidence that every aspect of the referendum is as unbiased as can possibly be achieved, it will be open to suspicion of political influence. It must also be remembered that the landslide vote which produced the unexpected outright majority for the SNP at Holyrood does not mean voters have suspended their critical faculties. Quite the reverse. A feeling that in some areas the Labour Party was taking support for granted was a significant factor in the swing to the SNP. Mr Salmond should not forget that the boot could just as easily be transferred to the other foot. The lesson from this consultation is that every aspect of the referendum process must be overseen, from the beginning, by a politically neutral and independent body such as the Electoral Commission. Elsewhere, following a series of questions over the way the SNP and Alex Salmond have handled donations and donors to the party, it has emerged the first minister has now written to Dame Elish Angiolini, one of the independent advisers on the Scottish ministerial code, to ask her to investigate whether a breach of the Code has occurred. Oh come on. I normally quite like this blog, but this is blindly partisan and just silly. The use of language such as “screeching u-turn” is so horribly skeweringly misplaced it’s difficult to take seriously. 414 responses were anonymous – 3.5%. Surely “seeking to emphasise” that is rather important, as it puts the entire basis of the shrill allegations coming from Lamont/Sarwar straight to bed. That means abuse of the consultation hasn’t been “enormous” but in fact, miniscule. Then after that any abuses of the process will be vetted and discarded by independent analysis. The so-called “climbdown”, which really is just a minor administrative change (albeit with sinister implications), is simply to placate a media who have deigned fit to give Labour exposure on this and covered the so-called “story” incessantly. A forced climbdown which has resulted in the right, which should exist in any free, open democratic society, to be able to give your political views with anonymity, being demonised and now forfeited – not surprising really, as it’s been forced at the behest of a party with a recent history in government of anti-privacy anti-democratic authoritarianism, and a compliant media. As for Sarwar’s claims that the UK government’s consultation is more robust – oh look, turns out their rate of anonymous responses was 3.3%, pretty much identical to the Scottish government’s, and that’s with about 8000 LESS respondents. And they so far haven’t signed up to any independent verification! Lastly, why would the SNP need to abuse the system with multiple entries – they’ve got the largest party and the most active and enthusiastic campaigning base in Scotland – 21,000 members, 12% growth in the last year. If one-sixth of those members have all submitted, that’s already substantially more respondents than to the entire UK government’s consultation. This “story” is dead in the water, Left Foot Forward, and like most of the others is probably going to backfire on Scottish Labour in the polls and in the elections in May. But if you like that idea, keep mindlessly parrotting their poor man’s smears. Why is accepting that the Labour party have a point regarding anonymous and multiple submissions on the consultation a “humiliating climb-down”? Why can’t it be acknowledging that the opposition have a point and accepting that? Isn’t that what governance is all about and not sticking to an ideological standpoint and never admitting that you are in actual fact wrong? Perhaps if the Scottish Labour party tried cooperating with the Government instead of attempting to score silly political points at every turn the country would be more competently run! Fair article but I’m at a loss to understand what the fuss is about. Most other consultations (including those launched by other parties) have accepted anonymous submissions. That this is more important than other consultations, as the Herald suggests, is a mute point. It is, after all, a consultation. The important decision is 2 years away. It is nearly impossible to ensure that submissions, say from the same family with only one computer, or IP address, are from 4 family members or from 1 person resending. And although the Herald emphasises ‘cybernats’ (as you would expect from a labour leaning paper), at least it does admit that it is possible that a unionist might consider such illegal, or at least immoral, practice. When the referendum comes, it is important for both sides that the process be overseen from start to finish by an organisation that can have the confidence of all. The alternative is that one side will feel cheated, as happened in 1979, following the Krone Report. It will be hard to find such an organisation. But I think it will have to be an international body. Nothing set up by, funded by or controlled by either the UK or Scottish governments will do. I’d suggest that observers from the UN and/or EU be used, under the chairmanship of someone like Jimmy Carter or Kofi Annan. As for a “humiliating climbdown”, I don’t really think so. And it Ms Lamont thinks it is, all she is doing is showing how little experience she has of government. An interesting study would be the 1500 contributions to UK govt consultation from labour, to see how many mirror the suggested reply from labourhame and how many have actually though about it in a constructive manner. That is excellent – the logic astounds me! If the SNP act incompetently it’s Labour’s fault! You couldn’t make this stuff up! The other excuse I heard is that it was Westminster’s fault. The reality is that there was no fault because there was no problem. BYKT. Why shouldn’t people make anonymous submissions? It’s not a vote after all, and nobody “wins” a consultation exercise. But if it were a vote then the votes would be anonymised. Paint me very confused indeed. Like the voting system referendum, there will be secret funding and bought media. Now come on LFF – this is really and surprisingly partisan and unfair. The method for responding to the public consultation on the referendum in Scotland is EXACTLY the same as the one used by the Westminster Parliament – meaning you can be anonymous, request anonymity, give your name but refuse to be publicly acknowledged or give your name to be used freely. Why is the Scottish Govt being criticised for following the same process used by both previous Scottish administrations and sister Parliaments at Westminster ? Double standards if you ask me. Then the other issue for those of you not familiar with the small world of Scottish politics but smarting from the Bradford West debacle is that given the much talked about ‘Bradree’ factor the Scottish Labour depute leader Anas Sarwar comes from a Glasgow context where he succeeded his father as the sitting MP. IMO Dynasty building and democracy are oxymorons. Labour are the hegemony in Scotland (until v. recently) and IMO use their power vexatiously to thwart not just the SNP, which may be their political raison d’etre, but indeed democracy itself. Why do the Scottish people need to go through all these legalisitc and administrative hoops just to get the self-determination that every other European citizen gets as a matter of right ? Wow referencing Alan Cochrane in the Daily Telegraph to make an argument. A new low for LFF. Just how do you come to that conclusion? You sound like a Daily Mail reader! Labour in Scotland, or Tory-lite as they are commonly known, has already bought the media in Scotland. Have a read at the Daily Retard or the Scotsman. They read like a Labour press release! Just try and find a piece in any of the Scottish MSM that takes a balanced look at the referendum. As have I. Are you suggesting that I’m wrong and that the above papers are NOT unionist songsheets? There’s a distinct difference between a couple of papers advocating a point of a view and a controlled press. Try having a look at the columnists and writers in the above songsheets. I think you’ll find that they’re “stowed oot” with Labour placemen! Alternatively, you could speak English, but that’s obviously out too. Why do you always resort to abuse when the facts are inconvenient? Have you no philosophy to defend? Right wing? You’re saying that I’m right wing? You’ll be telling us that Labour are left wing next! No, I don’t deal in patent untruths.